Powerful bass is one thing, but powerful bass that can be placed anywhere in a room to achieve the best possible sound is another. Thanks to the new WA-2 wireless subwoofer kit, convenient bass enhancement of music, home theater and whole-house audio systems is now possible. The two-piece kit, composed of a transmitter and a receiver, conducts a simple pairing process that syncs the transmitter and receiver the first time they are used; after that, the sub is automatically activated when ready for use. This accessory is meant to add simplistic wireless capability to the already superior performing Klipsch Group, Inc. subwoofers, including the Klipsch SW-110, SW-112, SW-308, SW-310, SW-311; the Energy ESW-M6 and ESW-M8; the Mirage MM-6, MM-8 and the Jamo Sub 800. What’s better than powerful, heart-pounding crystal-clear bass? A Plug n Play subwoofer that you can place anywhere in your room to create the ultimate surround sound experience. That’s what the WA-2 Wireless Subwoofer Kit (sold separately from Klipsch subs) allows you to do. You can send bass wirelessly from your home theater receiver or processor or stereo receiver to compatible Klipsch subs that come equipped with a WA Port - movie night will never be the same. The Klipsch WA2 two-piece wireless kit adds wireless audio capability to select Klipsch subs in a matter of second. This eliminates the need for a subwoofer connection cable that’s both unsightly and costly and which traditionally needed to be connected between a receiver and a sub. Since you’re not restricted by the speaker cable, you can then place the sub beside the couch, tuck it under a side table, or keep it in the back of the room, wherever it’s the most convenient, or wherever it looks best. The transmitter connects directly to the sub or line output of a home theater receiver, or AV preamp processor using a RCA connection cable, and a receiver that connects to a proprietary “WA Port” on Klipsch subwoofer models. Using an “advanced automatic channel selection technology,” the wireless signal transmits within a 50 inch (15m) radius. 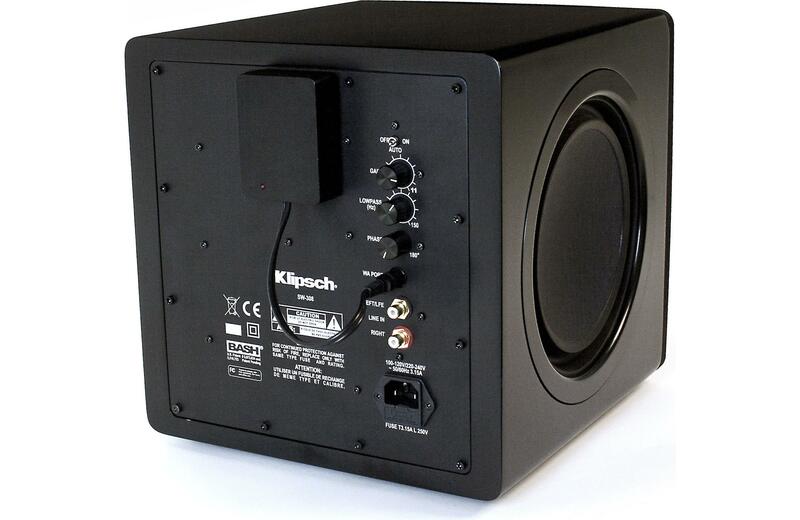 This two-piece Klipsch subwoofer kit, which allows for hassle-free setup, comes with a compact transmitter and a receiver. These sync to each other the first time you use them. Once the initial pairing is complete, the subwoofer is automatically activated whenever you need to use it. This cuts the hassle of manual pairing.